« Weld Fixture Specialists Offers New Products to Manufacturers. Protective brass caps for fasteners help manufacturers re-use components and make changes to machine tools. George is good at coming up with great designs. He and his team were behind the idea of RAPid Tooling Components back in 2000. So I let him stew on it. I told him that once he got a few made we needed to send them into the real world to be tested. It didn’t take him long to come up with a design for RAPid Caps. So we sent some out to our customers to try on their fixtures. The feedback was terrific and orders came in before we were set up to market them. RAPid Caps obviously fill a need in the welding and weld fixture world. RAPid Caps are made of brass. 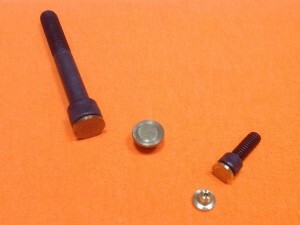 A round stem presses into the socket of a socket head cap screw and covers the top of the screw leaving a slight gap between the head of the screw and the RAPid cap. 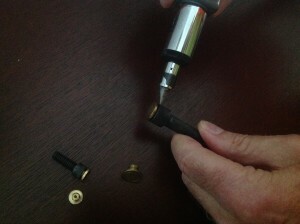 The tip of a screw driver is wedged into the gap and pops the cap off. Adjustments and changes can be made. And the cap can be pressed back into the socket to provide spatter protection again. RAPid Caps come in inch and metric sizes. Check out Rentapen’s RAPid Caps web page for sizes and ordering instructions. Tagged fastener protection, machine tooling, rapid caps, screw protector, shcs, shoulder screw, Socket head cap screw, socket wrench, tool changes, weld fixtures, weld guard for fasteners, weld spatter, weld tooling. Bookmark the permalink. Susan Straley, aka Queen of Lean Machine Design, is the President of Rentapen Inc. in Waukesha, WI. She helps manufacturers reduce costs through excellence in 3d desing services, RAPid Tooling Components(TM), and Just-in-Time Laser Cutting Services(TM). Susan can be reached directly at 262-542-8891. Weld Fixture Specialists | Powered by Mantra & WordPress.